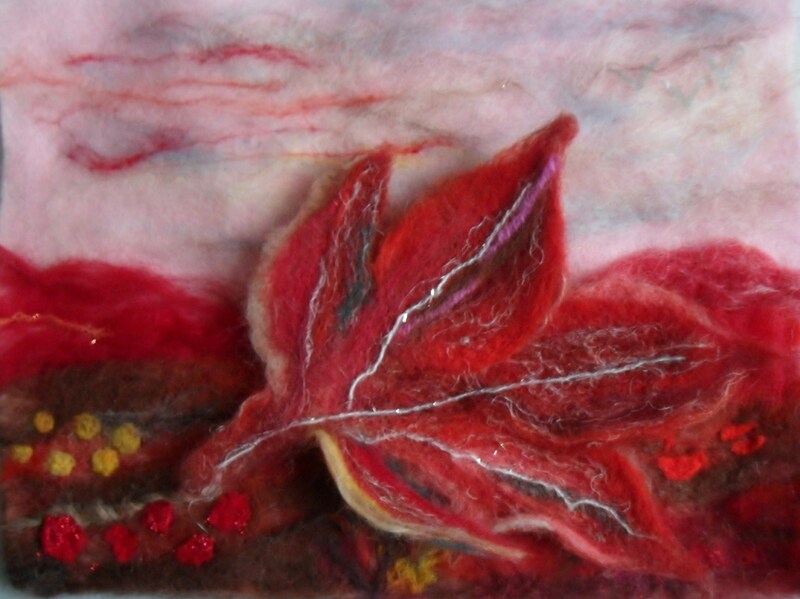 This beautiful 3D picture was one of several produced by Sheila during our needle felting workshops. Sheila worked with Merino wool and other mixed fibres, on a white felt background, to create a stunning autumnal scene. The picture focuses on the fallen leaf which was felted separately and added loosely in order to create a 3D element to the artwork. Felt is a fantastic medium for creating pictures – you don’t have to have the ability to paint but once you have mastered the basic techniques of felting you can produce fabulous artwork using the wool as your paint substitute. Adding other mediums such as organza or tulle fabrics, metallic threads, beads, etc. can also provide interest and added depth to your work. Keep watching for more great examples of felting produced in our workshops. Needle felted autum leaf – 3D picture.